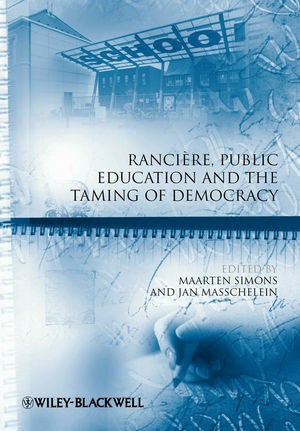 Rancière, Public Education and the Taming of Democracy introduces the political and educational ideas of Jacques Rancière, a leading philosopher increasingly important in educational theory. In light of his ideas, the volume explores the current concern for democracy and equality in relation to education. Maarten Simons is Professor at the Centre for Philosophy of Education, Catholic University of Leuven, Belgium. His research interests include educational policy, political and social philosophy and educational theory, with a specific focus on new modes of governance, globalisation/Europeanization and the public role of (higher) education and teachers. His recent publications include The Learning Society from the Perspective of Governmentality (ed., Blackwell, 2007) and Re-reading Education Policies: Studying the Policy Agenda of the 21st Century (ed., 2009). Jan Masschelein is Professor for Philosophy of Education at the Catholic University of Leuven, Belgium. His primary areas of scholarship are educational theory, social and political philosophy, and critical theory. His research currently focuses on the 'public' role of education (both secondary and higher education) in the age of networks and on 'mapping' and 'walking' as critical research practices. His recent publications include The Learning Society from the Perspective of Governmentality (ed., Blackwell, 2007). 1. Introduction: Hatred of Democracy ... and of the Public Role of Education? (Maarten Simons and Jan Masschelein). 2. The Public Role of Teaching: To Keep the Door Closed (Goele Cornelissen). 3. Learner, Student, Speaker: Why It Matters How We Call Those We Teach (Gert Biesta). 4. Ignorance and Translation, ‘Artifacts’ for Practices of Equality (Marc Derycke). 6. Governmental, Political and Pedagogic Subjectivation: Foucault with Rancière (Maarten Simons and Jan Masschelein). 7. The Immigrant Has No Proper Name: The Disease of Consensual Democracy Within the Myth of Schooling (Carl Anders Säfström). 8. Queer Politics in Schools: A Rancièrean Reading (Claudia W. Ruitenberg). 9. Paulo Freire’s Last Laugh: Rethinking Critical Pedagogy’s Funny Bone Through Jacques Rancière (Tyson Edward Lewis). 10. Settling no Conflict in the Public Place: Truth in Education, and in Rancièrean Scholarship (Charles Bingham). 11. The Hatred of Public Schooling: The School as the Mark of Democracy (Jan Masschelein and Maarten Simons). 12. Endgame: Reading, Writing, Talking (and Perhaps Thinking) in a Faculty of Education (Jorge Larrosa).